Remember the 1990s? I do! While there were some very cool styles, there were some truly awful ones, too. Then, there's this: 1990s Akihbara fashion. 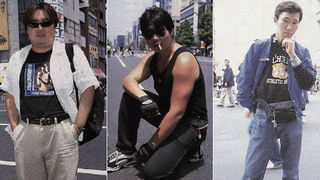 Recently posted again online, these scans show off what some people (well, these people) were wearing in Tokyo's geek district of Akihabara in a much simpler time. Note that some of these styles have become otaku (geek) stereotypes, such as ponytail hair, backpacks, bandanas, anime-themed shopping bags, and button-up shirts. The tough guy (below) in the black tank top, though, sure is something else! Subculture mag Gon! originally published an article called "Akihabara Street Fashion News," around the turn of the century. Around that time, Akiba fashion was also covered by other Japanese mags. Because so many of these outfits have become stereotypes, I'm not entirely sure if this article is in earnest. Many of the profiles have goofy titles like "Here's a Summer Style Monopoly" or "A Sakura Paper Bag Enlivens the Akiba Mood." Then again, regular Japanese fashion mags often have equally puzzling titles. Some of the interview comments in the profiles do ring true, like "I'm really into Robot Wars type things" or "I want a Love Hina phone strap" as well as the 15 year-old who said, "My mom bought this sweat shirt" or the dude in Air Jordans who said, "I hate the Final Fantasy games. I like Zelda."